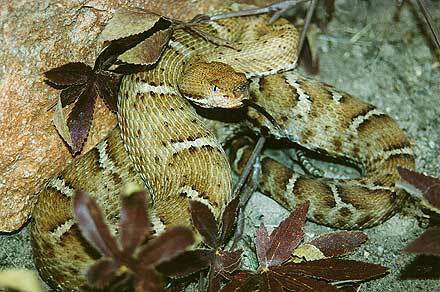 The Ridge-nose Rattlesnake has a conspicuously ridged snout. They are small montane rattlesnakes. Patterned with narrow crossbands. usually white or gray in color. The geographic range is in montane areas of Sonora and Chihuahua, Mexico. Usually found at rather high elevations. They also are seen in rocky canyons and deciduous woodlands. They actively search out small lizards and often eat small rodents and birds. Average adult length is about 18 inches but some specimens attain lengths of two feet.